Which Gola Am I? Surprise surprise, those covered in a decorative/floral print! Gola is a brand that's been on my radar for many years now, though this pales in comparison to their incredible history stretching out over a century. Since having been founded in 1905, Gola has well and truly made its mark as a sportswear and fashion brand, forever adapting to current times without comprising its heritage. More recently, they've collaborated with Liberty Art Fabrics to produce a colourful range of patterned rucksacks and trainers, including these gorgeous Samurai Liberty LL Trainers. As far as versatility goes, I'm pretty sure the Gola x Liberty collection can be worn outside of sun-drenched stone follies - but I figured I'd spoil them on their first outing! 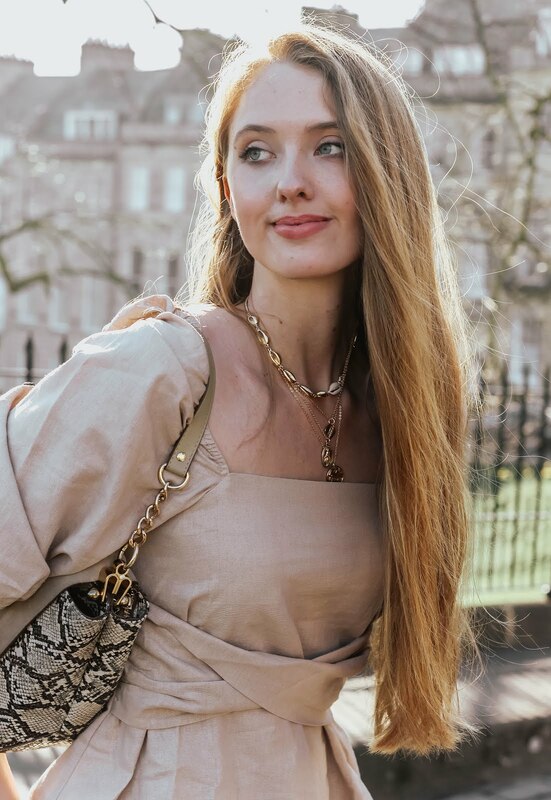 I've leaned towards street style on this occasion, teaming them with a halter-neck LBD by Karen Millen and the absence of jewellery to allow the shoes to do all the talking. Ultimately, the entire Gola x Liberty collection is ideal for getting from A to B in style; to and from an event, on your commute, out of the gym. The list goes on and on! Yep, these Gola Samurai Liberty LL Trainers are a very welcome (and comfortable) addition to my shoe wardrobe. Best of all, I can bounce, bounce, bounce my way out of the frame without getting a heel tip stuck between the paving stones! Love the shoes, great colours! Loving those super cool sneakers, lady. The print is subtle + cute! This is so pretty and I love the shoes!! How cute are you in this Gola shoes! Gorgeous! Really like how you have teamed these pink pretties with a LBD too. Great styling inspiration here, I think a pop of colour to go with any black garment is a great way to add some colourful character. These are so cute and fun, I love that you picked the unique option! I love them! but I love how you styled them more. I love the dress so so beautiful! You look smashing Gabrielle! What a cute collab! Gola has always been one of my favorite trainer brands because of their laid back cool vibe and you can never go wrong with a Liberty print. I'll have to check out this collection for sure. Molto belle con l'abitino nero..
Great pattern, so much fun and love how you've styled them! In love with the trainers. So cute! These sneakers are so cute! I love the small flower pattern! Aww, I really love your dress! And that shoes are so chic! They are so cute, I love the floral prints! I like the casual sporty way you give with the dress and sneakers! Love love love your shoes! Definitely very you :) Love Gola! Oh wow, these shoes are amazing. I'm not a trainers kind of girl but I can imagine them in my collection. Founded in 1905? Wow, where have I been all this while because this is the first time I came across this brand. You chose a gorgeous pair, Gabrielle. Great look! Loving the pics! I've not heard of the brand but it sure looks fitting on you. Have an awesome week, dear! I love these shoes! That dress is stunning. Oh I love these on you, I would never have even thought about checking out Gola but these are so pretty. You styled them perfectly hun! Of course you would pick the flowers. What else? They go nicely to the dress, and I can see them dressing up a more masculine outfit with a feminine touch as well. Black and pink. Sporty and chic. You're ridiculously gorgeous! I never actually tried Gola trainers, but they look comfy. Those shoes are amazing, I love the design. Styled with the perfect outfit. I love the way you mixed the two styles! Your Gola shoes look really adorable, I want them as well in this shade!!! I love that you paired these with a dress-the colors/combo is so fun and so summer. Looking good hun! I haven't heard of Gola, but these look so much fun! I love how you paired it with a dressier outfit - it all still ties together so beautifully! These trainers are gorgeous! You chose the perfect pair. And the folly is charming! You have such a great style, those sneakers are so lovely! And I really like that dress as well! Gabrielle, these are gorgeous trainers! They have such a lovely floral print. Loveee pairing sneakers with dresses, it's such a cute combination of being comfortable and chic! I haven't heard of this brand before but they look so stylish! I'm on a bit of a sneaker obsession recently too! They're so so lovely ! Wow since 1905 is amazing :) I really love the colour and the idea that you can use them for day time and then for the gym , that would be really useful ! Cute shoes!! It goes perfectly with the dress! I love how you styled these shoes with such a pretty and girly outfit! Definitely the best way to wear them! They're such nice shoes! I love how you can dress them up. I love the dress! Cute sneakers! This summer, I'm also embracing sneakers and dresses. Must be the most comfortable way to explore a city. Your sneakers from Gola looks really pretty and very elegant with the dress. Black and pink are such a nice combination! I like the pink black design! I have never worn any Gola trainers but they do look great. I saw those on your instagram!! Loving the design! I never owned a pair of sneakers with a design -now I wish I did! That dress is stunning and so are those shoes. You look beautiful! I love how you styled this outfit! Dress and runners are always a good idea! You're so pretty in theses pictures, love the colours of your shoes !